After reading a book of three hundred pages or so or watching a film two hours or more, the story ends and the characters we either admired or despised disappear from our lives. Sure, they may find a place in back of our memories, but unless the book or the film is truly memorable that brief encounter with a different age, world, people, or culture usually fades away. However, have you ever thought about this? Despite the quality of the book, after reading the last page, or despite the quality of the film, as I watch the credits scroll, I want to know what happens next? Where do the protagonists I have given so much time to go or do next? Was the love they expressed truly blissful and blessed? Or, was justice truly served? As so many books and films do, there is what is called a denouement, a second ending after the story’s climax is told to answer our questions. For example, in biographical or true story films there will be a statement that the main characters lived to be ninety and had three children, six grandchildren, and twelve great grandchildren, and so forth. There may be an afterword in books telling what happened after all the excitement ended. We want to know what happened. We also want to know in our own lives what will happen. Too often we are observers of our lives, not participants. We are characters in a book or a screenplay. Any number of questions can be asked when our personal dramas announce, “The End.” But, really it is not the end. The end of something, a story, a year, a life, is always a new beginning. In the car demolished by falling debris caused by the Great Alaska Earthquake of 1964, a woman was trapped. She was rescued after everyone believed no one could survive this sort of catastrophe. At this time of the year, only a few days before we begin a new year, television news commentators, newspaper editors, and I suspect some of us, have been looking back over this year and think about what we have experienced individually, as a community, and as a nation leading me to believe that we are not ready to say, “The End” to the year that has past. But, as the girl sings in the movie “Frozen,” let it go. Certainly, no matter how glum the news may have been, there have been some good times. Young couples married, children were born, the rising stock market added to some people’s wealth, and many have gone back to work after many months of unemployment. Actually, the future looks bright. We can and should mourn the tragedies and celebrate the happy moments. For some the news seems worse than ever, for some this year was the beginning of new opportunities, and for others life seems to be about the same. This Sunday brings us to only a few days before end of a calendar year, which also provides for us a time for looking forward; hoping we can fulfill our plans for the changes we want, travel on planned vacation, and maybe an increase in our earnings. Most of us are filled with joy and hope New Year’s Day—but, we often end each year with everything we hoped for fading into unfulfilled dreams. The coming year is likely to be no different than the year we have just experienced—happy moments interrupted by sadness and sometimes despair. During the coming months there will be earthquakes, catastrophic storms, a new crisis in the Middle East, terrorists will continue to threaten the people of Syria and Iraq (especially Christians who have lived there since the first century), riots resulting from policemen shooting unarmed black teenagers will take up television news and columns of newsprint, and, of course, there will be famine in Africa. Nonetheless, there is reason for the faithful to be hopeful. The Gospel lesson for the First Sunday of Christmas is the famous poetic opening to the Gospel according to John. Every time I read this passage of Scripture it lifts me to a higher level of hope. I learn in this brief passage of Scripture that in the beginning the Word of God was already poised to offer to the world a source of grace and to call me back to a more solid and fundamental relationship with God. The ancient Book of Genesis relates that the earth was part of a vast void and God’s Big Bang changed that condition. The story of God’s relationship with creation starts with the words, “In the beginning…” In this ancient story the universe comes into being, the sun and the heavens illuminate the void, the earth comes into being, and life emerges. 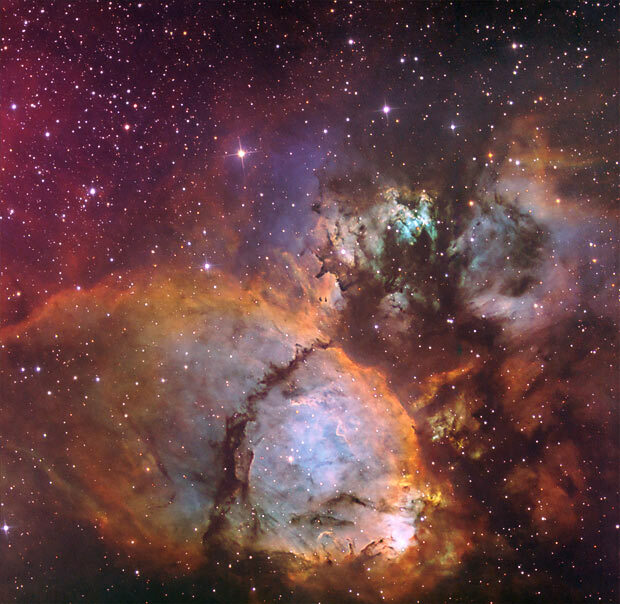 In all the explosions of nova and supernovas, the Word of God was there. The Word of God was in the Big Bang. All was good. 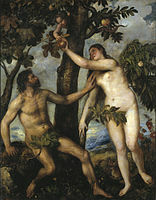 Adam and Eve taking the fruit from the tree of knowledge. Painting by Titian. Therefore, the only constant in life is change. Every change provides an opportunity for a beginning. 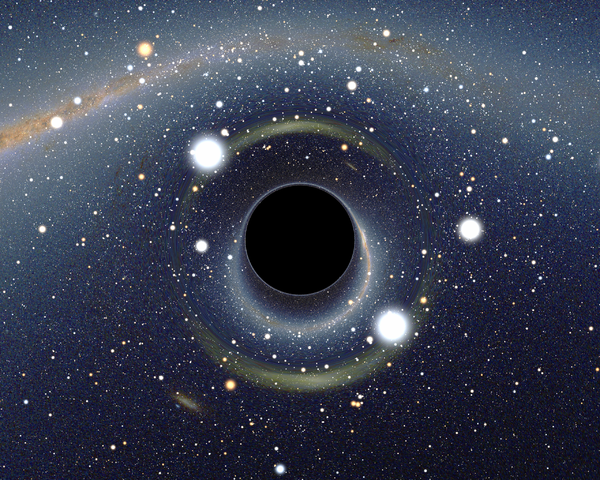 Because humanity has gained skill and knowledge, black holes are more than theoretical. Everything is in flux, evolving. The galaxies collapse into black holes, but we can be certain that even if the universe collapses, it will be a beginning for God. Our faith reflects a connection that is older than time. John wrote, “In the beginning was the Word and the Word was with God and the Word was God.” It is the same beginning described in Genesis. The beginning John wrote of, however, is a beginning of grace. The first humans fell from grace by trying to think like God—a condition that still exists, but the beginning described by John, the difference is the Word of God is grace—in fact, grace upon grace. In that grace humanity is redeemed and God now blesses humanity with knowledge and skill to build a better world.